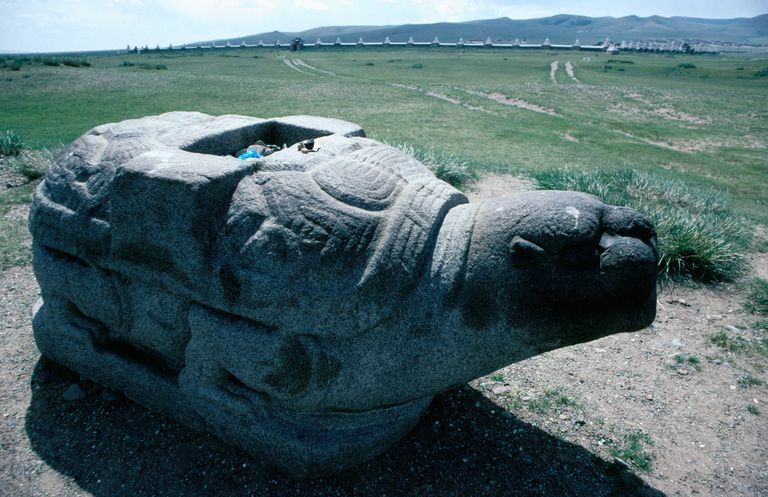 A stone turtle, almost all that remains of Karakorum, the onetime capital of the Mongol Empire. The turtle, with a stele holder on its back, defined the boundary of the city. In the background is Erdene Zuu monastery, where the ancient city's remains are located. Karakorum (or the Karakorum and occasionally spelled Kharakhorum or Qara Qorum) was the capital city for the great Mongol leader Genghis Khan and, according to at least one scholar, the single most important stopping point on the Silk Road in the 12th and 13th centuries CE. Among its many architectural delights, said William of Rubruck who visited in 1254, was an enormous silver and gold tree created by a kidnapped Parisian. The tree had pipes which poured out wine, mare's milk, rice mead, and honey mead, at the bidding of the khan. The Karakorum was the name of the 13th century capital of Genghis Khan and his son and successor Ögödei Khan, located in the Orkhon valley of central Mongolia. It was an important oasis on the Silk Road, which began as a city of yurts and gained a substantial population, a city wall and several palaces for the Khan beginning about 1220. The Karakorum was cool and dry, and had trouble feeding its population of about 10,000 without importing food from China, which is one of the reasons that Ögödei Khan moved his capital away from the site in 1264. Archaeological remains of the city are not visible on the ground but have been found deeply buried within the walls of the Erdene Zuu monastery. There is little to see at the Karakorum today that dates to the Mongol occupation—a stone tortoise cut in a local quarry as a plinth base is all that remains above ground. But there are archaeological remains inside the grounds of the later monastery Erdene Zuu, and much of the history of Karakorum lives on in historical documents. Information is found in the writings of 'Ala-al-Din 'Ata-Malik Juvayni, a Mongol historian who resided there in the early 1250s. In 1254 it was visited by Wilhelm von Rubruk (aka William of Rubruck) [ca 1220–1293], a Franciscan monk who came as an envoy of King Louis IX of France; and the Persian statesman and historian Rashid al-Din [1247–1318] lived in the Karakorum in his role as part of the Mongol court. Archaeological evidence shows that the first settlement of the Orkhon (or Orchon) River floodplain in Mongolia was a city of trellis tents, called gers or yurts, established in the 8th–9th century CE by the Uighur descendants of the Bronze Age Steppe Societies. The tent city was located on a grassy plain at the base of the Changai (Khantai or Khangai) mountains on the Orkhon river, about 215 miles (350 kilometers) west of Ulaan Bataar. And in 1220, the Mongol emperor Genghis Khan (today spelled Chinggis Khan) established a permanent capital here. Although it wasn't the most agriculturally fertile location, Karakorum was strategically located at the intersection of east-west and north-south Silk Road routes across Mongolia. The Karakorum was expanded under Genghis's son and successor Ögödei Khan [ruled 1229–1241], and his successors as well; by 1254 the town had about 10,000 residents. According to the report of the traveling monk William of Rubruck, the permanent buildings at the Karakorum included the Khan's palace and several large subsidiary palaces, twelve Buddhist temples, two mosques and one eastern Christian Church. The city had an exterior wall with four gates and a moat; the main palace had its own wall. Archaeologists have found the city wall measured 1–1.5 mi (1.5–2.5 km) long, extending to the north of the current Erdene Zuu monastery. Major streets extended into the city center from each of the main gates. Outside the permanent core was a large area where Mongols would pitch their trellis tents (also called gers or yurts), a common pattern even today. The city population was estimated to have been about 10,000 people in 1254, but no doubt it fluctuated seasonally. Its residents were Steppe Society nomads, and even the khan moved residences frequently. Water was brought into the city by a set of canals leading from the Orkhon River; areas between the city and river were cultivated and maintained by additional irrigation canals and reservoirs. That water control system was established at the Karakorum in the 1230s by Ögödei Khan, and the farms grew barley, broomcorn and foxtail millet, vegetables and spices: but the climate was not conducive to agriculture and most of the food to support the population had to be imported. The Persian historian Rashid al-Din reported that in the late 13th century the population of Karakorum was supplied by five hundred wagons of foodstuff freight per day. More canals were opened in the late 13th century but farming was always insufficient for the needs of the nomadic population which shifted constantly. At different times, farmers might be conscripted into fighting wars, and at others, the khans would conscript farmers from other locations. The Karakorum was a center for metalworking, with smelting furnaces located outside the city center. In the central core were a series of workshops, with artisans making trade materials from local and exotic sources. 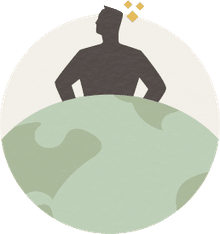 Archaeologists have identified workshops specializing in bronze, gold, copper, and iron working. Local industries produced glass beads and used gems and precious stones to create jewelry. Bone carving and birchbark processing were established; and yarn production is in evidence by the presence of spindle whorls, although fragments of imported Chinese silk have also been found. Archaeologists have found plenty of evidence for the local production and importation of pottery. The kiln technology was Chinese; four Mantou-style kilns have been excavated so far within the city walls, and at least 14 more are known outside. Karakorum's kilns produced tableware, architectural sculpture, and figurines. Elite types of pottery for the khan were imported from the Chinese ceramic production site of Jingdezhen, including Jingdezhen's famous blue and white wares, by the first half of the 14th century. The Karakorum remained the capital of the Mongol Empire until 1264 when Kublai Khan became emperor of China and moved his residence to Khanbaliq (also called Dadu or Daidu, in what is today modern Beijing). Some archaeological evidence suggests that occurred during a significant drought. The move was a cruel one, according to recent research: the adult men went to Daidu, but the women, children and elderly were left behind to tend the herds and fend for themselves. The Karakorum was largely abandoned in 1267, and completely destroyed by Ming dynasty troops in 1380 and never rebuilt. In 1586, the Buddhist monastery Erdene Zuu (sometimes Erdeni Dzu) was founded in this location. The ruins of Karakorum were re-discovered by the Russian explorer N.M. Yadrinstev in 1880, who also found the Orkhon Inscriptions, two monolithic monuments with Turkish and Chinese writings dated to the 8th century. Wilhelm Radloff surveyed Erdene Zuu and environs and produced a topographic map in 1891. The first significant excavations at the Karakorum were led by Dmitrii D. Bukinich in the 1930s. A Russian-Mongolian team led by Sergei V. Kiselev conducted excavations in 1948-1949; Japanese archaeologist Taichiro Shiraishi conducted a survey in 1997. Between 2000-2005, a German/Mongolian team led by the Mongolian Academy of Science, the German Archaeological Institute and the University of Bonn, conducted excavations. The 21st-century excavations have found that the Erdene Zuu monastery was likely built on top of the Khan's palace site. Detailed excavations so far have been focused on the Chinese quarter, although a Muslim cemetery has been excavated. Ambrosetti, Nadia. "Improbable Mechanics: A Short History of Fake Automata." Explorations in the History of Machines and Mechanisms: History of Mechanism and Machine Science. Ed. Ceccarelli, Marco. Vol. 15. Dordrecht, Germany: Springer Science, 2012. 309-22. Print. Eisma, Doeke. "Agriculture on the Mongolian Steppe." The Silk Road 10 (2012): 123-35. Print. Heussner, Anne. "Preliminary Report on the Ceramics of Chinese Origin Found East of the Old Mongolian Capital Karakorum." The Silk Road 10 (2012): 66-75. Print. Pederson, Neil, et al. "Pluvials, Droughts, the Mongol Empire, and Modern Mongolia." Proceedings of the National Academy of Sciences 111.12 (2014): 4375-79. Print. Pohl, Ernst, et al. "Production Sites in Karakorum and Its Environment: A New Archaeological Project in the Orkhon Valley, Mongolia." The Silk Road 10 (2012): 49-65. Print. Rogers, J. Daniel. "Inner Asian States and Empires: Theories and Synthesis." Journal of Archaeological Research 20.3 (2012): 205-56. Print. Turner, Bethany L., et al. "Diet and Death in Times of War: Isotopic and Osteological Analysis of Mummified Human Remains from Southern Mongolia." Journal of Archaeological Science 39.10 (2012): 3125-40. Print. Why Would the Zapotecs Build a City on a Hill?